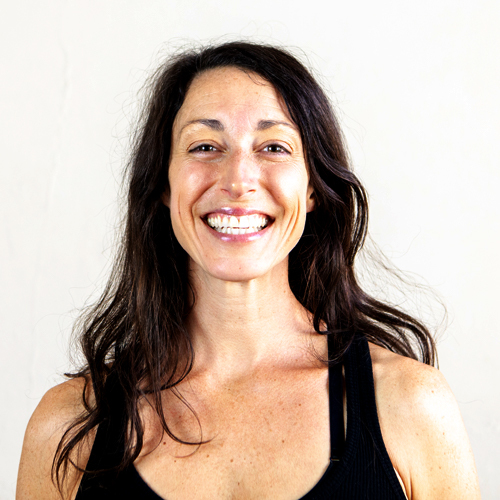 Sue is our very own in-house foodie + Ayurvedic geek who likes to make a mess in the Yoga Mandali kitchen once a month. She used to think food was about rules + recipes, but then found yoga: where she learned to let instinct win. When it comes to food, she listens to her body, and wants you to listen to yours. Fueled by her dad's incurable blood disorder, she attended the Institute of Integrative Nutrition in NYC, where she met and fell in love with Ayurveda, yoga's sister science (and the most sensible way to look at food, ever). Upon graduating in 2007, she founded Nourish + Flourish, with the intention of helping people eat curatively + happily. When you come to a cooking class at Yoga Mandali, you might learn how open a pomegranate or what on earth to do with miso paste. You might also look a jar of peanut butter square in the eye and turn it into a badass batch of cookies in 5 ingredients total. Because this is how our Suze rolls: seriously SIMPLE. Mainly because she believes the less complicated your food, the less complicated your life. More mainly than that, this mama has 3 small kids and cannot afford to fiddle around with a litany of ingredients. Her cooking classes are based on compassion + common sense. Sue is also a proud graduate of Gopi Kinnicutt's 200 Hour YTT program, holds a BA in Psychology and M.Ed. in School Counseling from the University of New Hampshire, where she also used to tear it up as a midfielder on the lacrosse team. She's a recovering perfectionist, semi-recovered jock, and fully recovered vegetarian. She's addicted to caffeine and looks forward to a cold one with her husband at the end of the day. She is reliant on her yoga block + the Blessed Mother. Her favorite chant is Loka Samasta Sukhino Bhavantu. Her favorite cue "let the head go." Her favorite foods are kale + cake… and her favorite teachers are her 3 children... they rock her world.